Blog Article – Microfibre, Friend or Foe? Microfibre has been gaining speed in the cleaning industry since its initial adoption at the end of the 20th century. Now a household and commercial favourite, this popular material is used to produce a host of different cleaning tools including cloths, mops and mitts (you can even get couches made out of microfibre). Touted as one of the biggest and best cleaning breakthroughs of our time, Agar asks, is it as good as it seems? Microfibre’s main claim to fame is its ability to clean without the use of chemicals. The unique structure of the fibres allows it to capture soil, liquids and bacteria far better than natural fibres. Traditional cleaning cloths have fibres that are shaped like a cylinder and have a tendency to push dirt and moisture around, requiring a scooping technique to remove soil. Blended microfibre is shaped like an asterisk (*) and has the ability to pick up and lock in dirt, dust and moisture into the fibres, to clean and dry the surface. The material is highly absorbent, made from a combination of polyamide (nylon) and polyester fibres, they are able to soak up both solids and liquids. Around 100 times finer than a human hair, microfibres can also reach into tiny cracks and crevices in a surface and scoop up bacteria. Furthermore, microfibre is positively charged which allows it to attract and capture dust, making the cleaning process quicker and faster. The claim that microfibre has the ability to disinfect surfaces by removing bacteria and soil has resulted in some households and commercial enterprises shifting to chemical-free cleaning. While the benefits of microfibre are clear, there is research to suggest that its cleaning power is reduced over the life of the cloth, which may result in a higher turnover of cleaning equipment and decrease its status as an environmental saviour. Furthermore, disinfecting microfibre is problematic and can pose real problems when used as a sole tool for reducing microbes in sensitive environments such as hospitals. As previously discussed, the cleaning power of microfibre is greatly attributed to its ability to capture and absorb a greater amount of soil and liquid than regular cleaning material. This feature, however, has its downsides as the bacteria can be very difficult to release from the microfibres once captured. The cloths can only absorb so much soil before they become ‘full’ and thus must undergo effective laundering in order to release the bacteria. If the cloths are not cleaned properly they lose their ability to pick up further soil and can potentially transmit bacteria previously held within the fibres. This problem is made worse by the delicate nature of the fibres and the limited options available for safe laundering. Research has been conducted into the decontamination capacity of cleaning cloths including microfibre, cotton, sponges, and disposable paper towels which are commonly used in hospitals. One study examined each cloth’s ability to remove microbial loads from surfaces when new and after being laundered 10 and 20 times at 90°C for five minutes in a washing machine (Diab-Elschahawi et al. 2010). The results concluded that microfibre cloths achieved the best results when being used in new condition, however, after multiple reprocessing, cotton cloths showed the best overall efficacy (Diab-Elschahawi et al. 2010). The warm and soiled environment of cleaning cloths provides a breeding ground for bacteria to feed and multiply. Studies into microfibre’s reluctance to release bacteria during laundering has resulted in both silver and triclosan being embedded into the cleaning cloths to kill bacteria. 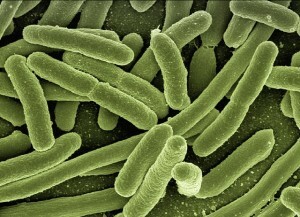 Another 2013 study published in the American Journal of Infection Control titled “Microbial Contamination of Hospital Reusable Cleaning Towels” revealed that 93 percent of the reusable hospital cleaning cloths tested contained bacteria including E.coli, total coliforms and Klebsiella after laundering (Sifuentes et al. 2013). The cloths tested included cotton and microfibre and led the researchers to conclude that regular hospital laundering processes were insufficient in disinfecting cloths (Sifuentes et al. 2013). In order to sustain microfibre’s effectiveness, the cloths would need to be regularly replaced or disposable microfibre cloths would need to be adopted, greatly impacting its sustainability claims. Made from petrochemicals, microfibre fabric is essentially plastic and can easily melt or be damaged when heated. While natural cotton cloths are well suited to handle bleach and heat high enough to disinfect, effectively sanitising and preserving microfibre cloths poses a problem. There is a range of conflicting information available on how to safely launder microfibre, with the normal recommendations set out below. These practices may not be effective in completely removing soil or bacteria from the cloths. With these restrictions on laundering microfibre cloths, how can we be certain that they are going to be completely sanitised before returning to use? 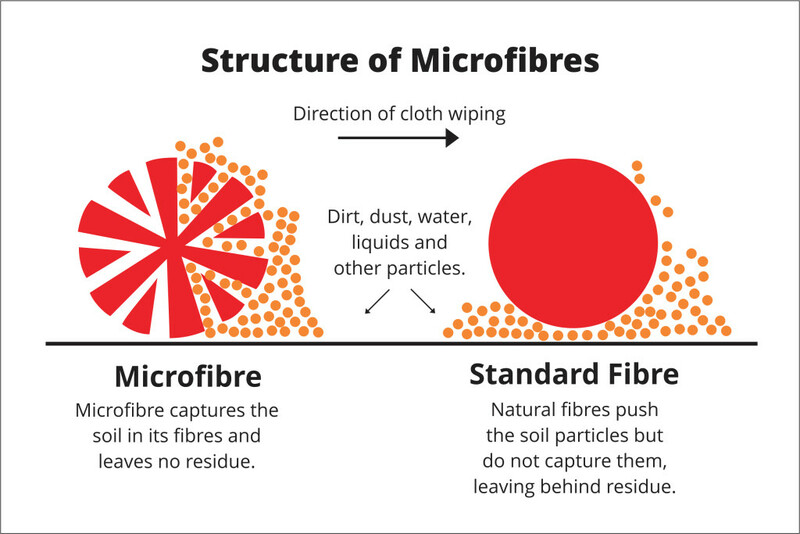 Similar to the issue with bacteria, microfibre’s extreme absorbency means that it is very difficult to clean completely, resulting in the possibility of dirt particles remaining locked in the fibres. The cloths may begin to look dirty and stained, even after they’ve been washed, and can risk scratching surfaces if grit is left behind in the weaves. Detergents can suspend solid particles, emulsify oils and fats and prevent re-deposition of soil onto the surface. Microfibres cannot achieve all of these functions, rather they tend to smear oils and fats across a surface. Over time, this can lead to a build-up of fatty matter on the surfaces. This can provide a breeding ground for bacteria and it may require a stronger detergent to remove it and rectify this problem. Microfibre cloths are made from petro-chemicals that are non-renewable and non-biodegradable. Scientific research has found that every time a synthetic-fibre piece of clothing is laundered, 1900 tiny pieces of microfibres are released, ultimately ending up in the ocean (O’Connor, 2014). Too small to capture, the same thing would occur when washing microfibre cloths. Numerous studies have shown that small organisms readily ingest microplastics (microfibre is made from the same ingredients as plastic), introducing toxic pollutants to the food chain (O’Connor, 2014). Surfaces that need to be disinfected may find that using a disinfectant together with a natural fibre cloth is more effective in the long term. Reusable, biodegradable cloths and mops are a better solution for the sustainability of landfill and waterways. Cotton and cellulose materials are made from plant-based fibres and have the ability to break down naturally. They can be easily washed using biodegradable detergents and disinfected using heat during the laundering process. Save microfibre for the jobs where nothing else will work and ensure that sufficient disinfection procedures are put in place to sustain their cleaning power and protect surfaces from reinfection. Diab-Elschahawi, M, Assadian, O, Blacky, A, Stadler, M, Pernicka, E, Berger, J, Resch, H & Koller, W 2010, ‘Evaluation of the decontamination efficacy of new and reprocessed microfiber cleaning cloth compared with other commonly used cleaning cloths in the hospital’, American Journal of Infection Control, viewed 4 December 2015, <https://www.ciriscience.org/a_296-Microfiber-Compared-with-Other-Commonly-Used-Cleaning-Cloths->. 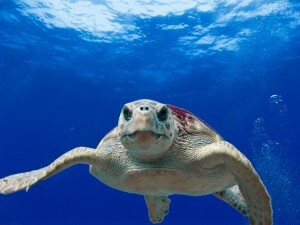 O’Connor, M 2014, ‘Inside the lonely fight against the biggest environmental problem you’ve never heard of’, The Guardian, 28 October, viewed 4 December 2015, <http://www.theguardian.com/sustainable-business/2014/oct/27/toxic-plastic-synthetic-microscopic-oceans-microbeads-microfibers-food-chain>. Sifuentes, L, Gerba, C, Weart, I, Engelbrecht, K & Koenig, D, 2013, ‘Microbial contamination of hospital reusable cleaning towels’, American Journal of Infection Control, viewed 4 December 2015, < http://www.ajicjournal.org/article/S0196-6553%2813%2900115-6/fulltext>.